These are pair No 19 for 2017. Finished "on the road" so it was appropriate to photograph them sitting on the pannier. I have not used this particular yarn before and I like it a lot. It's lovely to work with and feels good too. 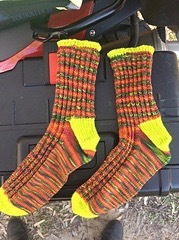 I used the last of some hi-vis green for the toes and heels to ensure there would be enough yarn for the whole pair.